First half marathon of 2016, and second half marathon overall done and dusted. A new pb for me, my nett time was 2h26m43s, beating my StandChart HM nett time of 2h31m16s. 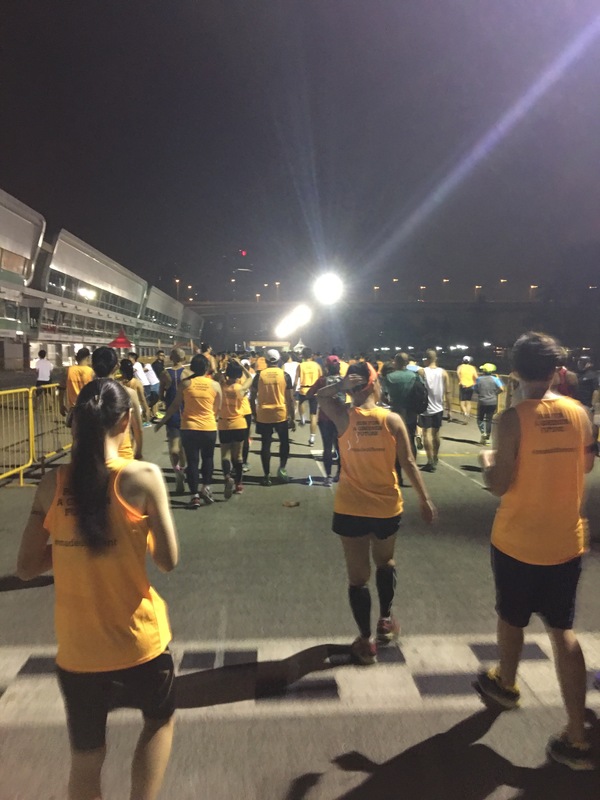 I signed up for this HM as a test of my endurance and fitness level for the upcoming Sundown Marathon, and the feedback I received from my body after the race told me that I really need to get those long runs in. 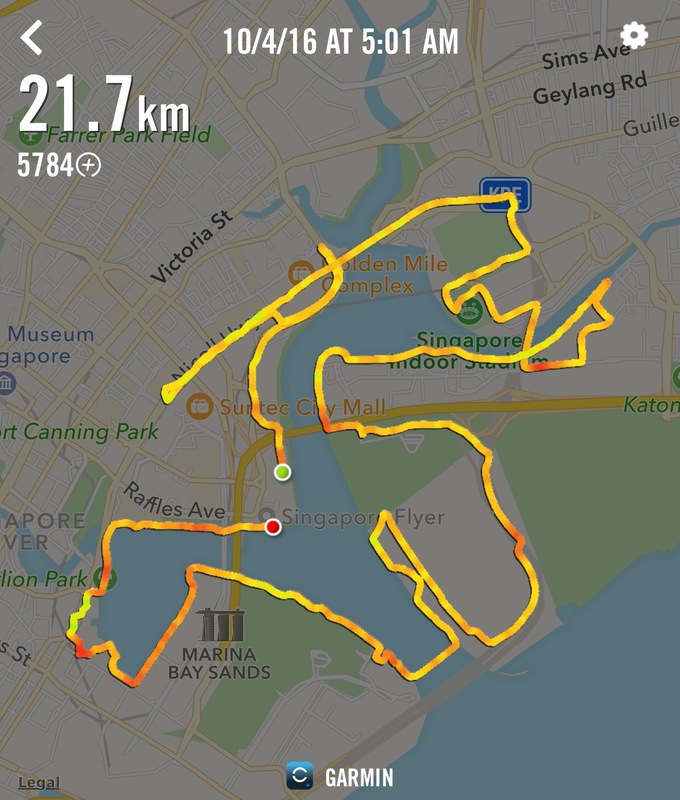 I went running at the Gardens by the Bay area before the race to get myself familiar with the route. The construction around the area changes the normal route by a little so I thought I should get a feel of it. My plan for this race was to run consistently for the first 15KM then slowly speed up towards the end. I targeted to finish in 2h20m. I woke up nice and early, ate a banana and went to the race site. What a striking sea of orange there! Straight away, I hit the portable loos first. The portable loos were arranged in a L shape making queuing for it tricky. Most people ended up queuing for the toilets at the outer side since the queue for the center ones were blocked by those queuing for the outer ones. The queue was rather long, some had 20 people queuing for it, mine had about 8 (I managed to squeeze in to queue for the center toilets). After using the loo, I went to the starting pen. Time check: 4:40AM. There were 3 eagle eye security there to ensure that everyone had a bib on. There were already many runners inside the starting pen when I reached so I thought that I would start in the second wave again. However, after some chit chat from the emcees ( I was standing too far to hear what they were saying most of the time), the horn sounded and the race began on time. Runners began to move forward and I managed to reach the starting line around 2 mins later (still within the time frame for the first wave) and started running. This time, I took it slow. I started with a good speed of 8.8-9km/h. I told myself that a HM is a long way to go, so really not to push myself. We ran towards Republic Ave first, there was a slope there, but luckily we did it at the beginning of the race with fresh legs. There was also a hydration point around here, which I thought was stationed too early in the race since we only ran 1KM. We continued towards Suntec and I started picking up speed to 9km/h, my target consistent speed to run at for 15km. A second hydration point was located here and we U turned to run towards Stadium. I caught up with the 2h30m paces here, and ran past them. This was also where I checked the distance I ran on my Garmin vs the distance marker. Garmin reads 4.65KM, distance marker 4KM. I got my first fluid intake at the Stadium hydration point, there was only water here. The volunteers looked like they were not coping well with the influx of runners, the table was not filled with cups and I overheard them asking each other to hurry up. It is indeed tough being a volunteer stationed at the hydration point. Thank you for your hard work! I checked my Garmin again, 6.65KM vs 6KM. I thought that it might neutralise towards the end of the race so I didn’t think too much of it. We ran across the bridge towards the Geylang Park Connector, and I hydrated myself with cool 100plus here. We then ran towards the Tanjong Rhu condos, the narrow path that is on my hated list. This time round, I thought that it was more bearable. Maybe I was in the first wave this time, hence there were fewer slower runners taking up the whole path. I took another 100plus at the 6th hydration point near passion wave @ marina bay, and we ran behind the golf course. I had a gel with me, but I decided to eat the banana at the 7th hydration point, 13km in, and conserve the gel first, in case I needed a boost of energy later on. There was a small part here where we had to run thru an unpaved path. Luckily, there were lightsticks on the ground to mark out the uneven parts. There was also a part here that was totally dark and the ground uneven, and we had to rely on twilight to guide us. By now, I was already thirsty and looking forward to a hydration point that was marked before the Marina Barage dam on the e-guide. However, there was no hydration point here, as instead it was located after the dam. I was supposed to speed up at the 16km mark, and I tried doing so, until side stitch occurred at the Art Science Museum around the 18km mark. I tried to power on, telling myself that by experience it usually subsides after 1km of running. However, it never did. 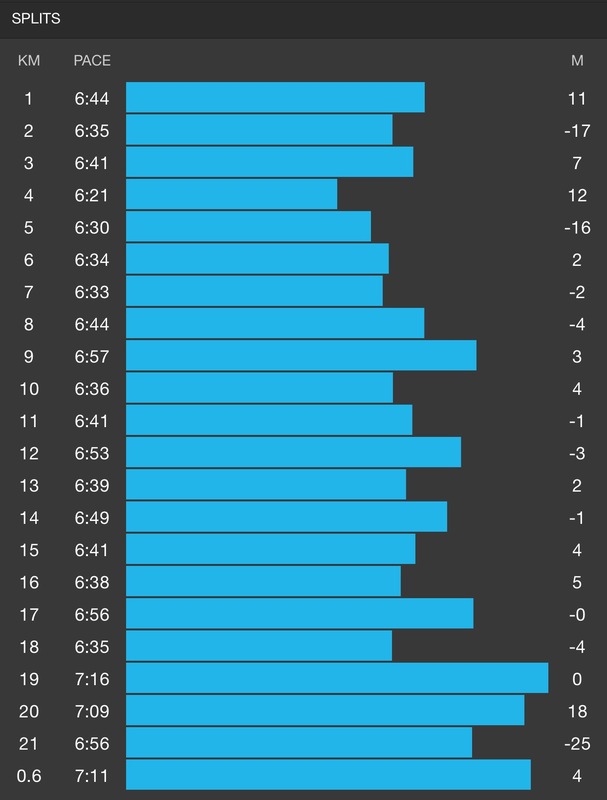 So for the final 3-4km, I was struggling with physical pain, and seeing how my pace was slipping off and time accumulating on my Garmin was a mental torture. I told myself that I could still beat my previous HM timing. While climbing the Jubilee bridge, I heard whistles blowing and saw that the 2h30m paces were right behind me. They became my motivation as I didn’t want them to overtake me and finally after it felt like ages, I passed the finishing line. 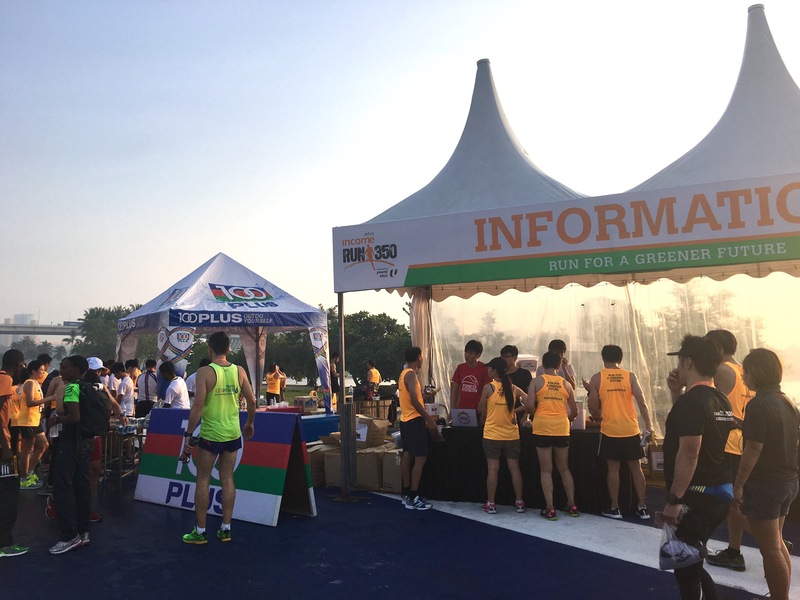 Upon reaching the finishing line, the HM runners and the 10km runners were separated. 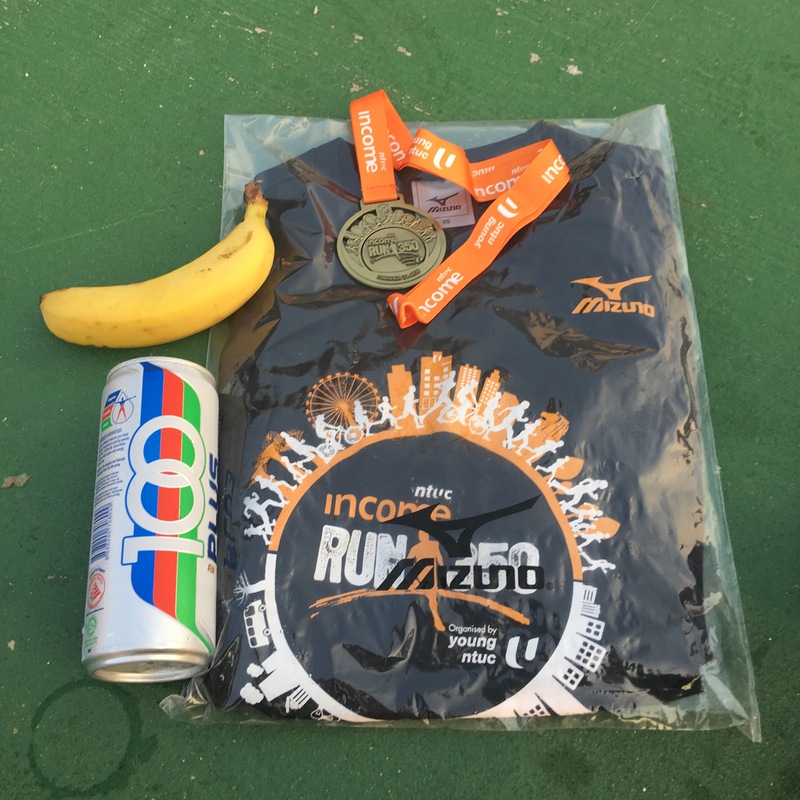 The HM runners were further divided into different lines based on finisher tee size, and I took my medal, banana, 100plus and finisher tee. There were many post race activities going on. I went to the hydration booth to get more water and spied that there was a queue for the massage booth. I was then too tired and went to catch some zzz. Running a HM needs a lot of mental strength so that’s why I usually go for the 10km option. It also takes some planning, as you will need to plan your pace as well as how much you will want to hydrate during the race. You will also have to train for it, else it is impossible to get a decent timing. This is also what makes a HM interesting as there is so much build up and it is really so much about the race process. I’m glad I did my second HM with Run 350 as it was not too crowded since it was one week after the 2XU Compression Run. The route was also relatively flat as compared to Standchart’s HM. There were ample hydration points (8 in total) at the beginning till the 16km point. There were also banana provided for fuel. The route was marked with signs to warn runners of slopes, steps, and lightsticks were used to alert runners of dangers. Being a race to raise awareness of being green, distance markers also had tips to be more eco friendly. Even the medal was made of 70% recycled metal. However, some downsides were that the arrangement of the portable loos into an L shape was a bad idea. 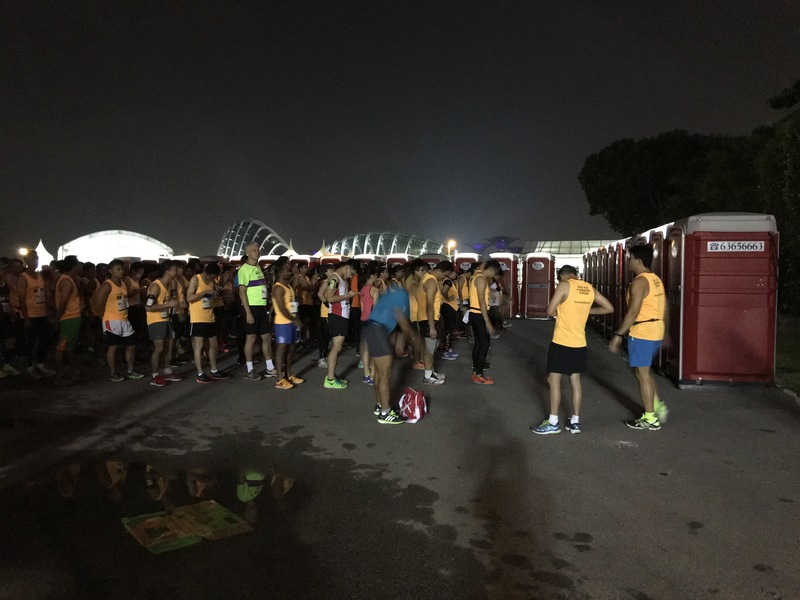 It made it difficult to access the center toilets so many runners queued for the outer loos. Even though there were so many hydration points, there was only 1 hydration point at the 19km mark from the 16km till the end point. I thought that they should eliminate the one at the 1km mark and place it somewhere between here instead. The distance markers were off and they never neutralized at the end, so we ran more than 21.1km. Will I do Run 350 again next year? I think yes because it is relatively affordable and the positivities greatly override the negativities.